Psychiatry Unplugged: What is Psychosomatic Medicine? Soroya Bacchus, MD has over 23 years experience in the Medical Industry, possessing a number of significant achievements within Addiction Medicine and Psychiatry. Update: Starting in 2018 Psychosomatic Medicine subspecialty is now called Consultation-Liaison Psychiatry. Recently a doctor friend of mine asked me, "What is psychosomatic medicine?" When my answer was more vague than concrete, I realized clarification was in order. I glazed over just trying to type this out. In a nutshell it's medical psychiatry: the interaction of the mind and body in relation to the onset, process and progression of all diseases. It's understanding and practicing a healthy mind, healthy environment and healthy personality mean physical health, mental health and well being. It is a holistic concept of disease management leading to mind and body wellness. I literally assess the psychological, neurological, endocrine and immune status of the individual. I assess the medical disease status of the individual. 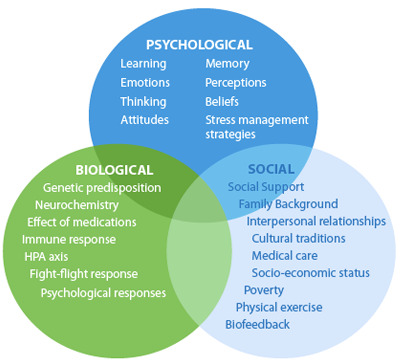 I understand personality, genetic and environmental factors that affect homeostasis or wellness. I evaluate and can improve patient function mentally and physically using evidence based medical treatment and psychotherapy techniques. The approach is integrative where the bio, medical, psycho and social aspects of wellness are considered. Psychosomatic medicine is the new field of integrative medicine. medicine subspecialists leave nothing on the table. Total health and well being is where the 3 circles intersect. I spend most of my time with the above evaluations particularly in chronic pain management and addiction medicine. I am able to improve mental function and outcomes in the setting of medical complications such as drug withdrawal and detoxification. My treatments are aimed at achieving wellness without relapse. I minimize polypharmacy and lifelong medication use. Polypharmacy and lifelong medication is antithetical to the definition of psychosomatic medicine. I know this definition seems long. One of my teenage patients said just call yourself an uber psychiatrist. I think I like that! Posted by Soroya Bacchus M.D. As an aspiring psychosomatic physician I truly appreciate this! I have been researching this topic trying to get a feel for what exactly this entails, and after quite a bit of wordy but unclear descriptions I stumbled upon your concise description: medical psychiatrist. Love it! Thank you. Every disorders have the right treatment. Choose the medication available. Medications just bring down symptoms.Psychotherapy particularly psychodynamic therapy helps people develop skills to stay well after medications are stopped for the majority of mental illnesses I treat. I'm someone who has IC/PBS. In spite of physical findings of bladder ulcerations, blood in my urine, decreased bladder capacity, etc., I was told by one doctor that IC/PBS is a psychosomatic disorder. Being told it was "all in my head" lead to me not trusting doctors and not trusting the psychiatric profession. Believe me, insulting your patients rather than trying to help them is NOT the best way to provide medicine - at least not from the patient's point of view. Because a doctor told me that, I suffered with my symptoms for years and lied to doctors, telling them I was "fine" when really I was suffering with considerable pain. A hysterectomy - and the clearing out of massive endometriosis - lead to a great decrease in my bladder symptoms. It's not totally gone, but I will not ever ask another doctor's help in this matter, since I no longer trust doctors due to the "all in your head" crap. It also adversely affected my health in another way - whenever I have any symptoms, I do not want to go to the doctor, afraid they may tell me it's all in my head. I came down with Guillain-Barre Syndrome last year (yes, I had the increased proteins in my spinal fluid, etc. not "all in my head) and I refused to go to the ER until I was no longer able to walk and my husband insisted on calling the ambulance. Luckily I was put on a ventilator in time to assist my breathing and I did not die. But you see how this "all in your head, and you CAUSED your own illness by thinking the wrong thoughts" will only lead to patient distress and possibly death, since naturally a patient faced with that kind of hostility and blaming will be reluctant to seek care when needed. I agree wholeheartedly. I have been hesitant to go to a Dr since I was a little girl. My mother was told all my ear infrctions, sinus problems, & bronchitis were because I was psychosomatic or a hypochondriac. I'm now 51 & still hesitant to go to the DR. Do to my inability to function as a whole person I consented to go to the DR & I wrote a page of things intermittently causing my poor health status. I thought as a whole these symptoms were l>ke a syndrome that could be narrowed down to one illness; instead I was told I was probably psychosomatic but the DR agreed to test s few symptoms @ a time. I dread going back. I already knew I had Fibromyalgia which he seemed to blow off as no illness @ all. AM I crazy? Yes to some degree I am; but, living w/ all these symptoms has in part made me so. Now I feel even more reluctant to go to the DR. After throwing up forcefully a pint of blood with golf ball sized çlots I was still hesitant to go to the DR. After my son showed him a picture of the evidence he perscribed Pepcid & srnt me home. What's wrong with this picture?! Would a psychosomatic physician treat someone with panic attacks and anxiety disorder? My M.D. and the "anti-depressants" are failing miserably. Yes. My training includes methodology that is beyond the experience of a general psychiatrist. Repeated failures suggest a diagnosis is being missed. to ''AnonymousNovember 21, 2012'' ''psychosomatic'' DOES NOT mean 'all in your head'. . you simply don't understand what they most likely meant..
mind is not separate to body.. it is all one .. mindbody bodymind. . cellular memory.. thoughts are things .. nothing is immaterial .. experiencing unpleasant metaphysical matter can manifest physical unpleasant matter..
negative emotions can send out biological messages which in turn can restrict blood flow which leads to lack of oxygenated blood to a certain area which will result in pain in that area..
once you've had your meds and feel your current condition improve, you'll see problems arise elsewhere if you haven't resolved the psychosomatic issue..
the future of true health is in holistic clarity for total clarity in health .. not reliance in and on others and exo chemicals .. I address each person's biology, medical issues, psychological states and social environment together. ALL add up to uniqueness of YOU. Was wondering if I should consult the doctor about his patient (my in law) when she is in this kind of care, but is actually that of a crack cocaine addict. Does this have anything to do with the treatment she is getting, would it change if he knew? I would like to help but don't know what is legal and what is not legal. Wondering if he knew of her addict if he would change or re route the applied methods. Yes it can make a difference. Even without a consent I can listen to anything anybody tells me without making any comments. I suggest you call the doctor, or leave him a voice mail about what you suspect or know. The doctor won't respond to you but will and can have a discussion with the patient. There is no confidentiality issues in the case of a life threatening emergency. Chronic obstructive pulmonary disease (COPD) is a type of obstructive lung disease characterized by long-term breathing problems and poor airflow. Tobacco smoking is the most common cause of COPD, with factors such as air pollution and genetics playing a smaller role. It's necessary to take copd disease. Wonderful post. I will definitely share this post at https://www.wattpad.com/story/150651077-dr-bill-weeks-in-lyme-and-his-love-of-art and i'm sure that everyone love it. very nice post. keep writing.good and quality content. This is surely a very good blog, thanks a lot for sharing such nice information here. I wish more people would post valuable content like this. This is the first time I've been on your website, but after this, I doubt it will be the last time. My new ebook ($1.99) is live! Safe, sane and EASY treatment if you're suffering. Check it out! Can't Sleep? 10 No Medication Tips! I'm a medical doctor who has been in practice since 1995. I am board certified in Addiction Medicine (ABPM) and Psychiatry (ABPN). I am an expert in mental disorders, diagnosis and treatment. I have been involved in all aspects of psychiatry including hospital and private office practice. I specialize in addiction medicine and psychiatry. I love what I do and I believe I can convey straight forward, concise, no spin information about all aspects of psychiatry. I am a psychiatrist unplugged. Dr. Bacchus is available by appointment only. Please call (310) 829-4640.